There are no dragons, but fierce kings and anxious queens are depicted in these rare medieval chess pieces uncovered on the Isle of Lewis. On a dark, wet winter’s night in the early 1800s, a worried farmer on the Isle of Lewis, just off the Scottish coast, went looking for a missing cow—at least that’s the local story. The man could hear the animal lowing in the distance, so he followed the sound until he finally located the lost bovine: one of its legs was lodged to the hip in a hole along the sandy coast. The farmer heaved and pulled until he finally freed the animal, then lowered his lantern into the ground for a look. Dozens of small pale human faces stared back at him. “He shrieked in horror and rushed home,” says archaeologist Mary Macleod Rivett of the University of the Highlands and Islands, recalling the tale she heard as a child on the Isle of Lewis. The little faces belonged to the Lewis Chessmen, 92 handmade gaming pieces that one recent scientific paper describes as among “the most appealing pieces of early medieval sculpture that survive.” Artfully carved of ivory from walrus tusks and sperm whale teeth between the late 12th and early 13th centuries and representing as many as four separate chess sets (some pieces have clearly been lost), the Lewis Chessmen, with their frowning kings and nervous-looking queens, are icons of the ancient Norse world, a realm of restless Scandinavian seafarers and warriors who explored and settled as far west as Greenland and Newfoundland. Most evidence suggests that carvers in the ancient Norwegian city of Trondheim created the Lewis Chessmen. During the medieval period, Trondheim merchants profited from a thriving trade in walrus ivory from Greenland, and local artisans specialized in carving this precious cargo into luxury goods destined for wealthy nobles and churchmen. Indeed, an ivory chess piece very similar to those discovered in Lewis was “found under the cathedral in Trondheim,” says Macleod Rivett. Archaeologists can’t say for certain just who brought the precious ivory chessmen to the Isle of Lewis or why. One local legend has it that a sailor stole this ivory treasure from a sinking ship in the 17th century, and that someone later murdered him and buried the gaming pieces, never to return for them. But archaeologists such as David Caldwell at the Society of Antiquaries in Scotland think there may be a simpler—though less colorful—explanation. Norse farmers began settling on the island by at least the late 10th century CE, and Lewis eventually fell under Norwegian rule. But in 1266, the Scottish king obtained Lewis and its island neighbors in a treaty ending military conflict with Norway. Caldwell suspects that a Trondheim noble or churchman intended to give the heads of Lewis’s old Norse families the costly chessmen in order to reinforce a long-standing allegiance to Norway—part of an ancient game of thrones. 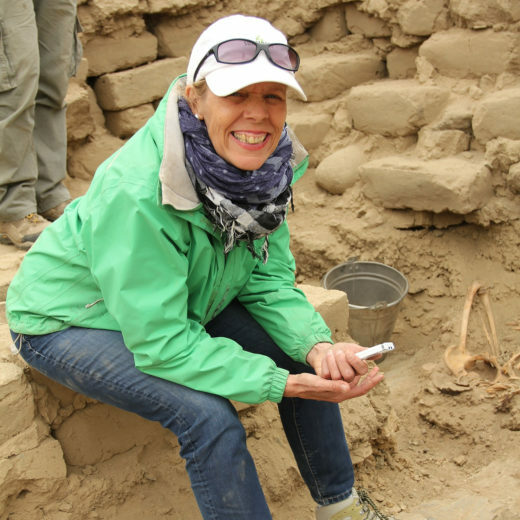 Heather Pringle specializes in writing about archaeology. She’s a contributing editor at Hakai Magazine and has written four books, including The Mummy Congress. She lives a 10-minute walk from the ocean and frequently walks along the water with her husband and their two Labrador retrievers. She has won both a National Magazine Award in Canada and a Science Journalism Award from the American Association for the Advancement of Science. Cite this Article: Heather Pringle “A Little Game of Thrones,” Hakai Magazine, Aug 5, 2015, accessed April 23rd, 2019, https://www.hakaimagazine.com/article-short/little-game-thrones/. Game pieces made of whale bone may be evidence of the emergence of industrial whaling in ancient Scandinavia.